For some reason, LEGO builders like to make very large spaceships in September. Many of them spend the entire month working on their models, only releasing photos at the last possible moment. But Shannon Ocean is starting the season off with a bang. 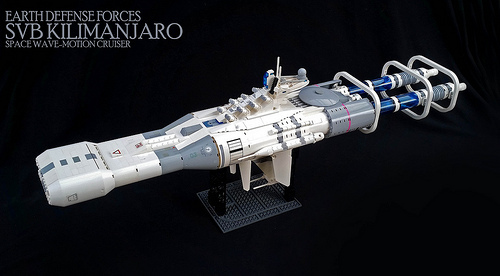 Not only is this ship over 100 studs long, it has a well-blocked color scheme and some great stickers. What really stands out, though, is the uniquely innovative warp drive at the tail end. It looks sorta like the front of an old 50’s-style raygun, but is also vaguely evocative of something late modern, like Star Trek. And, oh my stars, that studs-down base! I hope the rest of the month is this exciting.